Delhi University(DU) B.Com / B.Com (Hons.) Admissions Forms 2016 are expected to be available from the first week of June, 2016. DU shall be inviting B.Com 2016 applications for admissions to various courses offered in Faculty of Commerce. The DU B.Com / B.Com (Hons.) application form 2016 shall be available both online and offline. The online Application forms will be available online on Delhi University’s official website while the offline OMR forms will be available in various colleges under the University. Read the instructions given below carefully before filling the Online admission form for B.Com / B.Com (Hons.) courses in Delhi University. Candidates belonging to different categories including General/OBC/SC/ST/PwD are admitted to fill the online DU pre-admission form. Using a single Delhi University B.Com /B.Com (Hons.) Admission form, a candidate can apply for as many courses or programmes offered in the faculty of commerce by the University. The Online Application Form is common for each and every B.Com course listed in the form and is valid for all colleges except Stephen’s College and Jesus & Mary College. All candidates are requested to fill the Delhi University Online Application Form only after ensuring that the requisite courses/ programmes are available in the colleges offering Commerce programmes. It is important to note that any application forms that are incomplete or having insufficient information will be summarily rejected. As already mentioned, DU B.Com / B.Com(Hons.) Admission Form 2016 is available offline too. The Offline DU application form is expected to be available in as many as 18 centers during the first week of June 2016. 1. Candidates belonging to General category need to remit an application fee of Rupees One Hundred only (Rs 100), either applying online or offline for B.Com / B.Com (Hons.) Admissions 2016 in Delhi University. 2. Candidates belonging to SC/ST Category, need to remit Rupees Fifty only (Rs. 50) for the same. The OMR Common Pre-admission form is applicable to all candidates including General /OBC SC/ST/PWD. This single OMR Pre-admission form is valid for all colleges (except St. Stephen’s and Jesus & Mary) and for various courses listed in the OMR. Incomplete admission forms will be rejected summarily. a) The form is not folded, crumpled or mutilated in any manner. b) No marks should be made anywhere except wherever required. c) The bubbles must be darkened properly. d) The black marks on the margin of the OMR Form are important. It is advised to use only Blue or Black Pen to fill the OMR form. One can select as many courses as he wants. There is no limit on number of courses to be selected. This Pre-admission Form (OMR) has two sides. After filling both sides, take the photocopy of the form on single page i.e. both sides. Submit the form to any of the designated center and get the photocopy as acknowledgement. No Photocopies of certificates / documents / photographs are to be attached with the DU Admission OMR form. It is not necessary to submit the OMR form at the centre from where it was purchased. 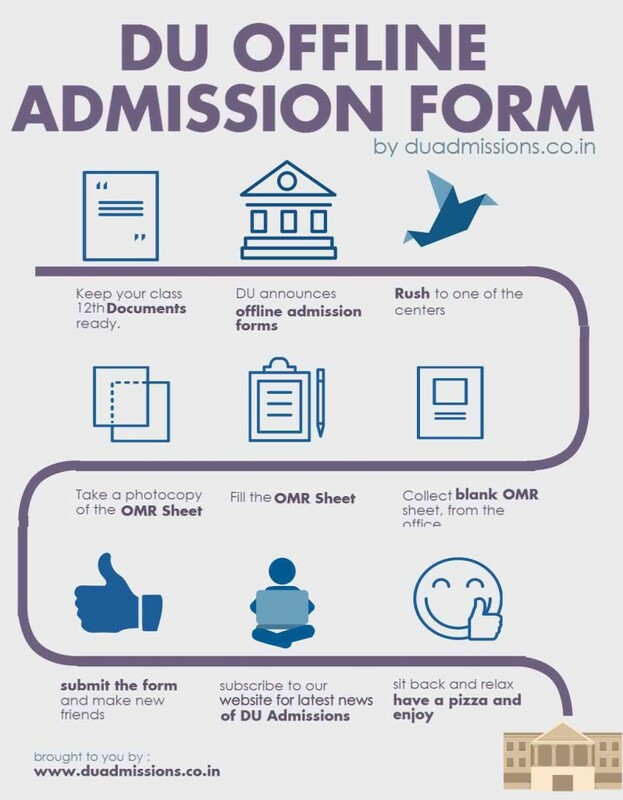 No fee is required to be deposited while submitting the form.The candidates who wish to be considered for admission to various courses in different colleges of the University, for which there is no entrance exam, are required to register either online at http://www.du.ac.in/ or offline by completing the OMR forms available and to be submitted at the respective centres in Delhi listed above.The duly filled offline applications shall be submitted in these centres on or before the scheduled dates that will be announced soon. There will be no Registration or pre-admission form available at individual college level. The candidates who are interested in applying for admissions to Stephen’s College and Jesus & Mary College, is requested to contact the respective colleges to know about their admission procedures. Admissions to the various colleges under the varsity depends upon a certain Cut-off and eligibility criterion decided by Delhi University. Though you can use this tool that we created to predict the Delhi University colleges that you might get at the time of DU Admissions 2016. We’ll also update you with the latest DU Admission 2016 Cut-offs list as soon as the university release them. To get notified of the latest news on Delhi University Admissions 2016 you can subscribe to our website and we’ll send the latest news to your inbox. Also, don’t forget to our facebook page. 1. DU B.Com Admissions 2016 Online Application Form begins – June 1st week, 2016. 2. DU B.Com Admissions 2016 Offline Application Form begins – June 1st week, 2016. 3. DU B.Com Admissions 2016 Applications closes– June 3rd week, 2016. If you have further queries or doubts, feel free to call Delhi University B.Com / B.Com (Hons.) Admissions Premium Helpline Number @ 011-40360360. Sir you can subscribe to our website using your email address to receive all the latest news and information right in your inbox. Update me with various info related to commerce stream and forms available with cut off list.. Thanks The information is very useful.so please sent the all latest news and information my email address. Hello Sanam, Yes Delhi University’s School of Open Learning provides distance education. Hello Sanam, the registration process will start from May 25 and yes you can take admission in DU if your fifth subject is Painting. is admission is done only by cutoff basis ..
or it can be by intrance also ..
Hello Prajjwal, refer to the article http://www.duadmissions.co.in/delhi-university-du-admission-forms-2016/ for all admission related queries. Hello, Sir. Can you please tell me about the admission process od DU for students doing IB Board. What is the grading scale for conversion of IB grades equivalent to Indian percentage? Do they accept students of Ib board on the basis of their predicted grade or is any there any other process because IB results comes out in the first week of July. Till that date, all the DU cut-off lists are already being released. 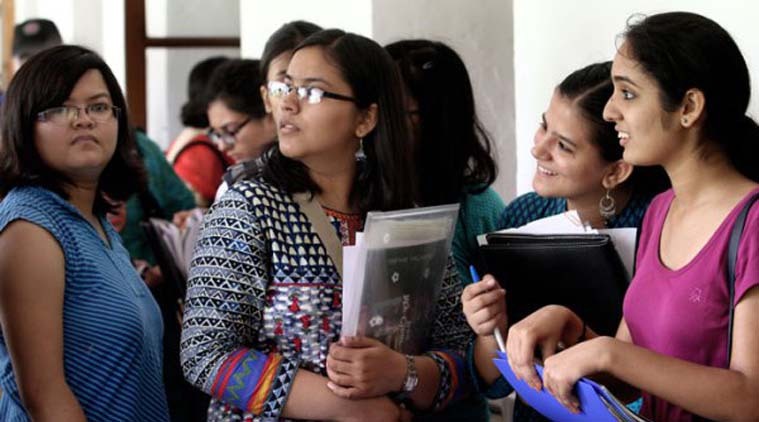 So how do students who have pursued IB board seek admission to DU. I hope you’ll revert me soon with an appropriate and authentic answer. It’s a major concern for me as the CBSE result will soon be declared and so does the DU admissions. I look forward to your reply. Sir please tell me that I have to fill the seprate forms for the separate college or whether I will get college by filling a single forms?? sir,may i know application form date and counseling date? Sir please tell me that for bcom admission I have to fill a single form or have to fill the form of every DU colleges. I want to admission for b.com Please tell me how to apply. and here it was written it will be published in the month of june…. What is omr form . Sir pls tell me when the forms are coming?? nd wt is the cutoff..
Hi, sir m Hrithik and i belong to gen. Category i just want to knw the requirements related with b.com and b.ba i just passed my 12th. Guide me from here which one is best? I want to know about the reservation of President awarded student for ug admission.. I want to get addmission du b.com me my dreams get addmission in du so please b.com me addmission de do. Hello Sir I want to know that in 2016 Bcom admissions are given on marks basis or entrance test? kindly send me all the latest information regarding b.com (hon.) ! Sir, I am Samrat from Punjab .My Category is OBC and i wanna get admission in B.com. Please help me in that to know about date of forms start and cutoff in B.com. Plz sir accept your b.com hon. I want to b.com hon. Is there any preference or seat reservation in DU for a Single Girl child of parents? Sir I have scored 93.75% in best four subjects. i want to do b.com but i didn’t take maths as an additional subject. can i still get admission in b.com/b.com(hon.)? I want to know that on which date registration for bcom was going to start in du. entrance exam is conducted for b.com programming ???? sir i have got 78% in 12 without math.can i get B Com (h) in delhi university. For a student of TN State Board Student how to compute Cut off marks.What is meant by 4 subjects to be considered ? Sir, is it compulsory To add maths subject in best 4 For the cutt off marks? For admission in acadmic year 2016-2017. Which subjects to be considered to calculate the percentage for admission in B.Com(H) in DU ? Sir, I am having 77% marks in best of five subjects in commerce. And I am not having maths as an optional paper. Am I eligible to take admission there in a decent college? Sir wat is d expected cutt off this yrr?? sir i have sports quota then what type of grace or else will help me to take admission in DU ? and when the forms are coming ???? I m 92% disabled. Have i got admsn of B.com in DU? sir, mere commerce with maths me best four me 96% h. but english ko add karte h to 92.4% hote h. sir, i want to know kya mujhe du ke top 5 collage me addmission mil sakta h. pls.i need ur sugg. sir do we have to mention best four marks % in du admission form 2016 …………………is there any column about it?? I want to know Details like eligibility and etc.about BCom and bcom(h) from du sol. Is commerce marks compulsory in best of 4 to gain admission to B Com Hons. in Delhi University selection. any management quota in du???? Is maths required in top four subjects for bcom honours? Yes Jyoti, it’s necessary to have maths in order to take BCom Hons. sir, is it compulsory to include maths in our best four subjects if we want to apply for b.com hons.? Sir I have scored 63 % in cbse board 2015_2016 .. Sir can u just tell me can I get addimmison in any college of du.. it can be in evening batch.. I have don’t with the form of du.. I want to know may i include physical education in my top 4 sub for b.com in du if yes then is there is any disadvantage of it?